Now you must take on that ever-intimidating first date. While a first date can be a road fraught with obstacles and snafus, when you have the proper guide, you can make it go off without a hitch. To help you not only get through your first date with a woman, but also enjoy it, we provide the following road map. Plan. Women are suckers for a man with a plan because it shows you have initiative, can think ahead, and aren’t shy about taking the lead. Don’t punt and ask her what she wants to do. Be a man! You’re the one doing the asking, so it’s your duty to come up with something that she’ll enjoy. When a woman is with a man that has a plan, they feel they can relax and really enjoy themselves. Clean the car. If you’re picking her up in your car, give it a nice cleaning before the date. First impressions matter big time on the first date, and women will check you like a drill sergeant at bunk inspection. Many women will use the cleanliness of your car to gauge how you carry yourself in the rest of your life. If you have empty 32 oz Big Gulp cups, old clothes strewn out in the back, and food crumbs everywhere, your date will assume your house is even messier and that you’re generally a slob during the rest of the week. Not a good first impression. Also, you might not notice, but your car probably smells. Leaving sweaty gym bags or Saturday morning’s fish catch in a car causes odor to build up in the upholstery. Spare your date the olfactory torture by airing out your car and spraying it down with Febreeze. Just give the car a quick wash, vacuum it out, and wipe down the vinyl. It will probably take an hour or so, but you’ll be left with a car that will impress your date, even if it’s a 89′ Honda Civic. Get some cash. Stop by the ATM and pick up some cash. It’s good for greasing palms during the evening, but you’ll also need it to pay for parking and other incidentals. Dress up to show respect. Dressing up not only leaves a good first impression, it’s just plain respectful. It shows your date you thought enough about them to put your best foot forward. When you show up in a pair of jeans and a t-shirt, it’s like telling your date, “Eh… I had nothing better do so I just came over in what I was wearing.” Even if you’ve planned a casual date, put on something dressy casual. No need to bust out a tie. Go for something like a pair of jeans, a button down shirt, a corduroy blazer and a nice pair of boots (shined, of course). Call her and tell her exactly what you’re going to do on the date. While you might not think about getting ready for your date until a few hours before you pick her up, a lady likes to plan ahead and think about what she’ll wear and how she’ll do her nails. Show your date that you have some gentlemanly forethought by calling a few days in advance and telling her exactly what you plan on doing with her. This will help her decide how she should dress and make herself up. Women really dislike being dressed inappropriately for the occasion. Moreover, by knowing what you two will be doing together, your date will feel more comfortable and relaxed which results in her having a good time. Wait for the surprises after you get to know each other better. Be on time. As my grandpa says, “A gentleman never keeps a lady waiting.” Arriving late shows disrespect and only creates unneeded anxiety in a woman. If you’re running late because of unforeseen circumstances, call your date and let her know your estimated time of arrival. Also, don’t show up too early. In my experience, women will use every available minute they have to get ready. Don’t piss your date off by showing up 15 minutes early while she’s still in her bathrobe. You’ll only embarrass her because you caught her without her best face on and now she’ll feel pressured to rush getting ready because you’re sitting on the couch. Trust me. That’s not a good way to start off the date. Come to the door. Only a jackass would honk. Open the car door for her. 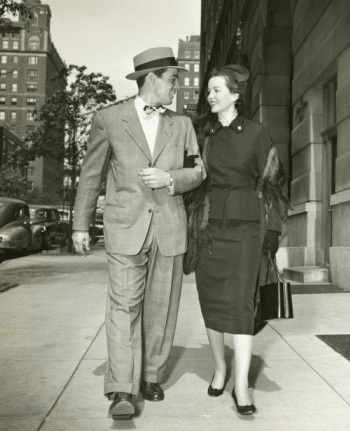 Show your date some old-fashioned chivalry by opening the car door for her. Offer her your hand for support as she slides into the car. Ensure all arms and hemlines are safely inside the car before you shut the door. Instead of music, try talking. Remember: first dates are for getting to know a woman. There’s no better way to do get to know someone than by talking with them. The radio can act as a crutch to avoid awkward moments of silence. If you have music on, both you and your date will probably do more listening than talking. Force yourself to converse with your date by leaving the music off. If you play music, play it softly and keep the list classy. AC/DC’s “You Shook Me All Night Long” or Sir-Mix-A-Lot’s “Baby Got Back” are not appropriate. Stick with some classic jazz or crooners like Frank Sinatra or Bobby Darrin. The music is pleasant, warm, and doesn’t distract from conversation. Remember to keep the volume down so you can hear each other talk. Oh, and don’t play NPR either. Sure, it will make you look “smart” and “enlightened,” but talk radio will kill the conversation between you two. Make a date with Terry Gross when you’re alone in the car and stuck in traffic. If you’re taking a cab… you should open the door for her, give the cabbie the directions, and pay. No movies. We said before and we’ll say it again: the point of a first date is to get to know the person. You can’t do this while you’re both staring at a movie screen. Keep it simple. You’re not proposing to her, so there’s no need to go overboard on the first date. Keep the first date light, fun, and romantic. You can’t go wrong with dinner and an evening at an art museum. Both activities allow you ample opportunities to talk and get to know each other. You Pay. No questions. If she offers, just smile, say, “It’s my pleasure,” and hand the waiter your card. Walk her to the door. You want to see that she gets safely into her place, and it’s just plain chivalrous. As you walk to the door, offer her your arm. It’s a non-threatening way to initiate body contact without seeming like a perve. Make your move? There’s no hard or fast rule on whether you should kiss on the first date. Just remember that women put a lot of meaning into a kiss, so don’t go for it if you don’t plan on pursuing a relationship. You just risk confusing and hurting your date. But if you feel like a kiss is in order, go for it. She might give you her cheek, but that’s alright. Just roll with it and play it like it twern’t nothing. There’s always next time. You can never go wrong with a hug. Unless it’s a side hug. Don’t go into her house. First, don’t ask if you can come in. It’s just sleazy. If she asks, decline. Why? It shows you’re a gentleman, and she’ll respect you even more. More importantly, it’s anticipation that creates romantic sparks (this is why chicks are nuts about those Twilight books). Leave her wanting more. Call her the next day. We’ve all probably heard those dumb rules about waiting a day and then a day before calling a woman you took out on a first date. Forget them. Just call the next day. Thank her for a lovely evening and if things clicked for you two, ask for a second date. If she’s not there, leave a message thanking her and ask her to call back. If she doesn’t call back within 48 hours, give another call. If she still doesn’t call back, learn to take a hint and pursue other options. And absolutely under no circumstances does a man text, Facebook or Twitter their date to follow up with them. Be a man, pick up the phone, and give her a call.